The LAB-X1 is microEngineering Labs, Inc.'s first pre-assembled experimenter's platform. While PICProto boards allow you to create your own projects with a minimum of hassle, the LAB-X1 goes one step further. 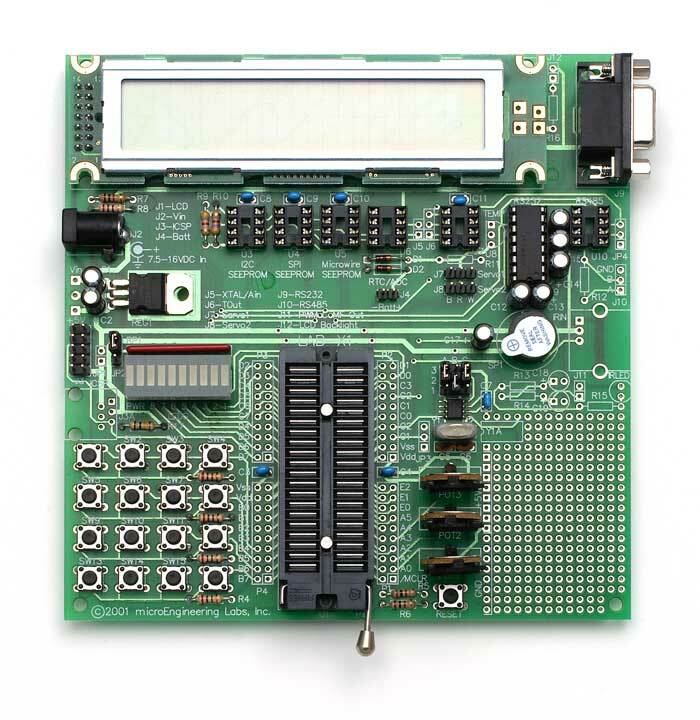 It provides an assembled testbed containing most of the circuitry commonly used with PICmicro microcontrollers (MCUs). The LAB-X1 contains the circuitry required by the PICmicro to operate: 5-volt power supply, oscillator, reset circuit, as well as additional application circuits. The crystal controlled oscillator includes jumpers to set speeds of 4MHz, 8MHz, 10MHz, 12MHz, 13.32MHz, 16MHz and 20MHz. Application circuits include a switch matrix, potentiometers, LEDs, LCD module, serial EEPROMS, real time clock, temperature sensors, servo connectors, RS232 interface, RS485 interface, IR interface and speaker. A prototyping area is also included in case we missed your favorite circuit. Many different projects may be created using the LAB-X1. Some examples include calculators, LCD clock, digital thermometer, LCD backpack, tone dialer, TV remote control and many more. The LAB-X1 can run programs written in assembler, C and PicBasic or PicBasic Pro. The LAB-X1 includes in-circuit programming connectors so the resident PICmicro MCU may be reprogrammed on the fly (requires flash device) using programmers that support this feature. Because the LAB-X1 itself is not a programmer, a separate PIC MUC programmer, such as the melabs U2 Programmer is required to program the MCU. All of the PICmicro MCU I/O pins are brought out to headers next to a 40-pin ZIF socket. This allows connection to off-board circuits as well as allowing on-board circuits to be connected to other pins, if desired. The LAB-X1 is designed to work with 40-pin PICmicro MCUs, but may be jumpered to work with smaller devices. It is recommended the LAB-X1 be used with the 40-pin PIC16F877A (available separately). This flash device has 8K of code space, 33 I/O pins, 8 ADC channels and may be reprogrammed again and again. The LAB-X1 is available in either assembled or bare PCB form. A parts list and schematic, along with PicBasic Pro example programs, are included.